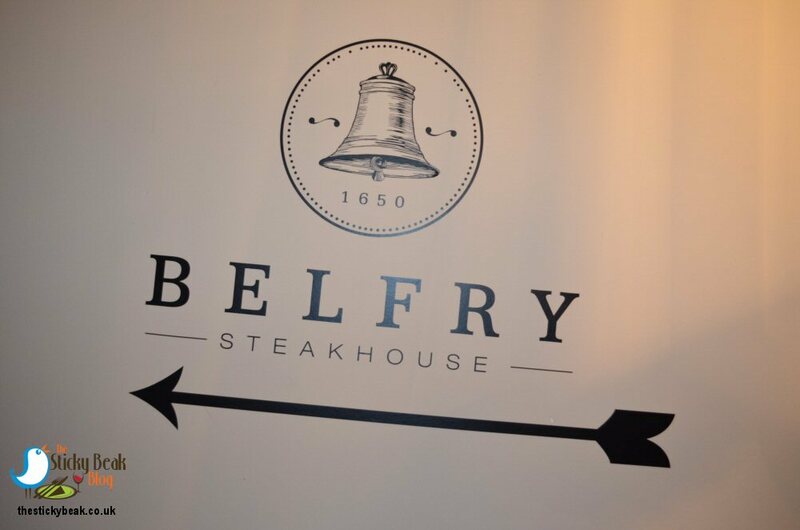 The Boy Wonder and I were very kindly invited to go along and sample the food at the newly opened Belfry Steakhouse in The Old Bell Hotel, located on Sadler Gate in the heart of Derby city centre. For those of you who don’t know, not only is the Old Bell Hotel one of the oldest buildings in Derby’s Cathedral quarter, but it is also one of the oldest and largest original coaching inns outside of London. 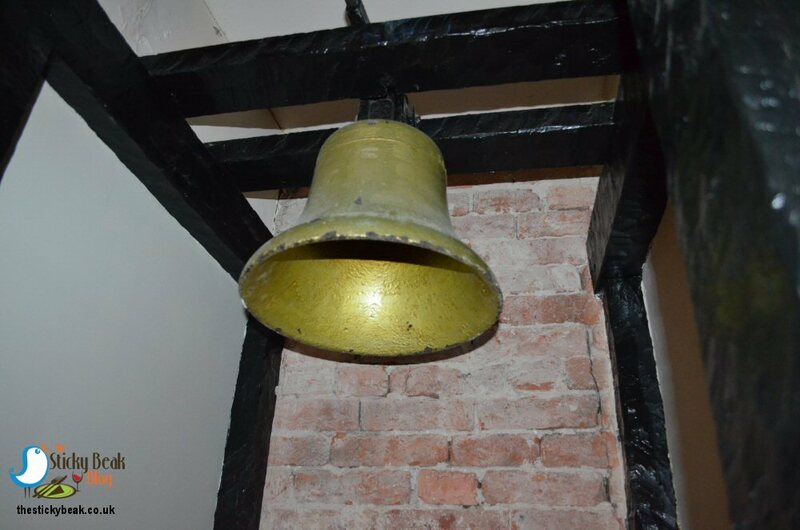 As well as being located adjacent to the Jacobean staircase that takes you up to the top of the building, The Belfry Steakhouse houses the original bell from The Old Bell Hotel; now hanging in the corner resplendent in all its restored glory. I loved the ceiling with its tapestried panels and the wooden beams; alongside the sash windows and richly patterned carpets all these features give the Belfry dining rooms a real sense of refinement and charm. We were greeted by an extremely smart young man and our coats were hung up before we were escorted to our table. The tables themselves are a dark wood, as are the dining chairs, which were deceptively comfortable. Callum, our server for the evening, asked if we would like water for the table and took our drinks orders too. We took our time looking through the menu, deciding on what we fancied to eat that evening. I already had a pretty good idea what I was having for my main course, having been dreaming of it all week; the 12oz T Bone steak had my name all over it! 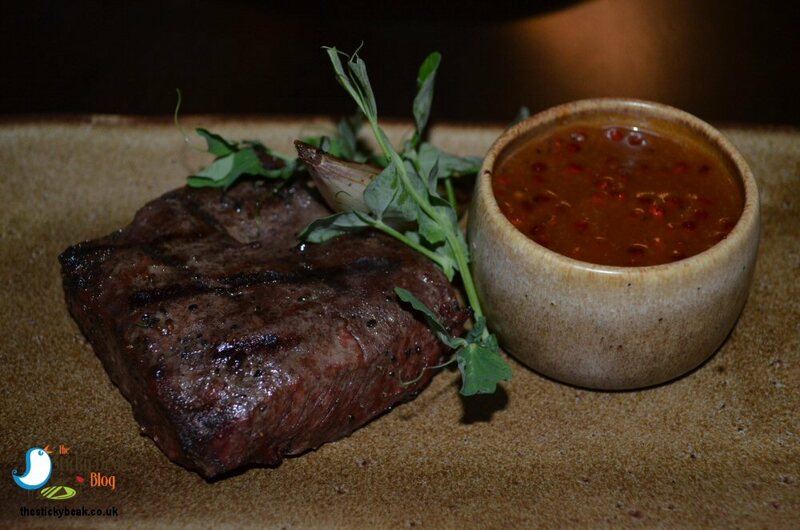 The Belfry Steakhouse has a Josper oven which cooks meat very evenly at really high temperatures, but retains all the meats natural flavour and juiciness. I figured that the combination of Josper oven and a high quality T Bone just weren’t going to be beaten, so that was my choice. His Nibs decided he wanted to sample the 8oz Flat Iron steak for his main course, so we just needed to choose starters and accompaniments. By the time Callum brought our drinks over and had poured some water out for us we were ready to place our orders. I had the Josper Smoked Mackerel with Carrots, Hazelnuts and Blood Orange to begin with; The Man Bird opted for the Barbequed Venison Carpaccio with Blackberries, Beetroot, Pickled Mushrooms, and Tarragon emulsion. To accompany the steaks I had the Lobster Mac ‘n’ Cheese (this carries a £3.50 surcharge) and an additional side of Radish and Watercress salad whilst The Man had the Triple Cooked Beef Dripping Chips. We also chose to have the Pink Peppercorn sauce (£1.50) and the Devilled Butter (£1) to go with the meat. As we awaited our starters several other groups of diners began to arrive and there was soon a gentle thrum of conversation rippling through the various dining rooms. The presentation of the starters was absolutely exquisite and had clearly been done with a lot of care and attention. 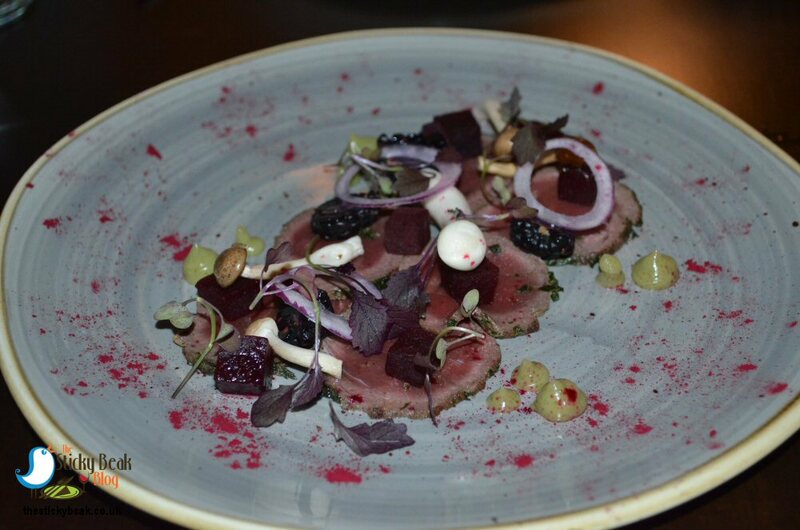 His Nibs’ Venison Carpaccio was very flavoursome and the meat itself was superbly tender and moist. Contrasting tastes were provided by the naturally sharper notes of the fruit being paired with the somewhat mellower and sweeter beet flavour. The Pickled Mushrooms were surprisingly gentle on the palate with no sourness to them at all. 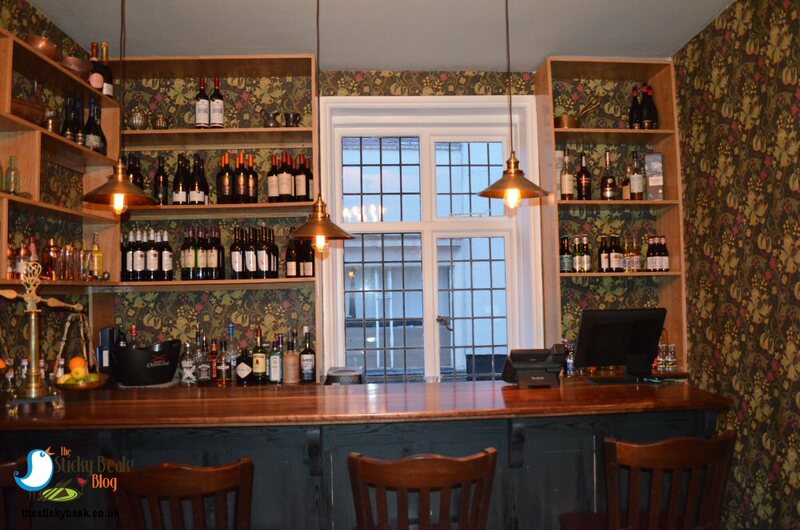 Callum came over to enquire as to whether the food was to our liking; we assured him that we were very happy so far. 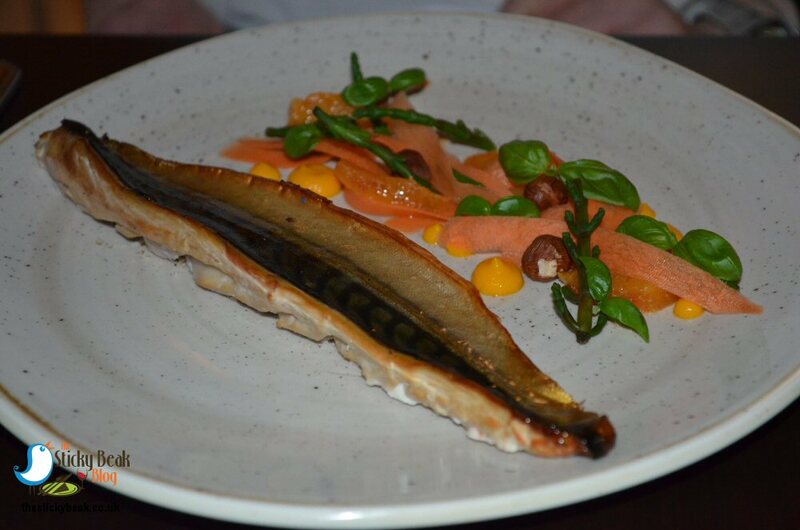 My Mackerel fillet was lovely and succulent with a nice light smoky hint to it that was more pronounced in the skin. The whole Hazelnuts gave some crunch and texture to the dish and delicate fronds of Samphire provided a salty tang in the mouth. From the Blood Orange came the much appreciated Citrus note that brilliantly assuaged the Smoky notes of the fish, resulting in a well balanced starter dish. I really liked the colour palate of my starter too, from a girly perspective it was very pretty to behold. It wasn’t long before our main courses were being placed before us and I was so excited to see my wonderful slab of T bone; it dominated the plate, with just some micro herbs providing a dab of colour to it. I had really been anticipating this moment for the entire week so I just inhaled its magnificent aroma and took a second to pay homage to the beast this had come from. Across the table, The Man Bird couldn’t help but smile at my unbridled glee. His steak looked every bit as good as mine and we equipped ourselves with cutlery ready and more than willing to tuck in but before we could take the first mouthful , Callum asked us to cut into the steaks to make sure that they were cooked to our satisfaction. I’ve never been asked to do this before, but when you think about it, it makes perfect sense to ascertain a guest’s satisfaction before bringing out the side dishes too. Happily, our steaks were done perfectly to our requests; rare for me, medium/rare for The Man. The pots containing our sides were swiftly brought out and we enthusiastically dug in. 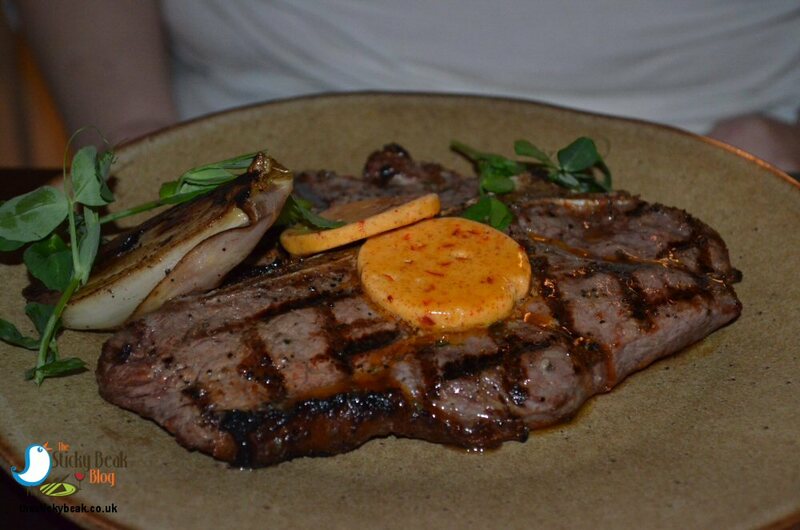 I cannot even begin to describe the joy my mouth felt as I took my first bite of the incredibly juicy, flavoursome steak; rapture would probably be the nearest sensation that is relevant. The Devilled butter had a lovely hint of heat to it, but didn’t detract at all from the main attraction; the meat itself. The Boy Wonders Flat Iron steak was just as accurate in its quest to hit the satisfaction area of the brain, scoring a direct Bulls’ Eye. Thanks to the incredible tenderness of the meat the knife just glided through it, and it had a rich, deep flavour to it that satisfied his primeval carnivorous need. Pink Peppercorns have a more rounded note than their Black cousin but still provide a wonderful spicy heat, which was just the ticket with this quality of steak. My Lobster Mac ‘n’ Cheese was blooming amazing; an abundance of Lobster flesh and perfectly cooked Macaroni were bathed in a robust cheese sauce that made my taste buds tingle. A great, thick crust of melted cheese just begged to be scooped up and eaten in one gobble, so I duly obliged and it disappeared into my grateful tum. 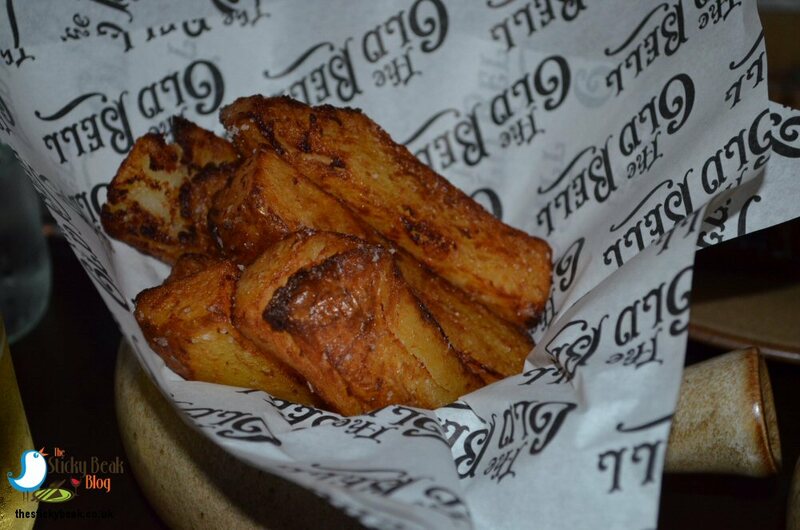 Now, good thick slabs of meat simply cannot be partnered by skinny fries (well, not in my opinion; although the Rosemary salted ones at The Belfry do sound rather nice), so My Man was jolly happy to see Jenga Block-proportioned Chips winging their way to him. In addition to being amply cut, they had superbly crisp outers and pillowy soft inners that still had plenty of body to them. 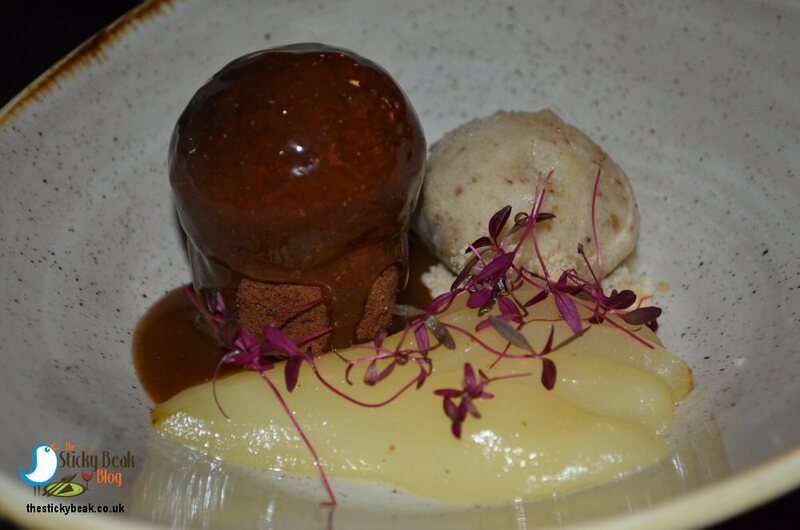 A delightful taste was released onto the tongue not only from the potato themselves but also from the Beef Dripping that had been used to Triple cook them. The Net Result? The BEST CHIPS the Boy Wonder has had the pleasure of eating. High praise indeed for The Chef and his team at The Belfry Steakhouse. As far as contrasts go, the pairing of a hearty piece of meat goes brilliantly with a crisp, fresh salad I think, and the Radish and Watercress one I ordered was gorgeous. 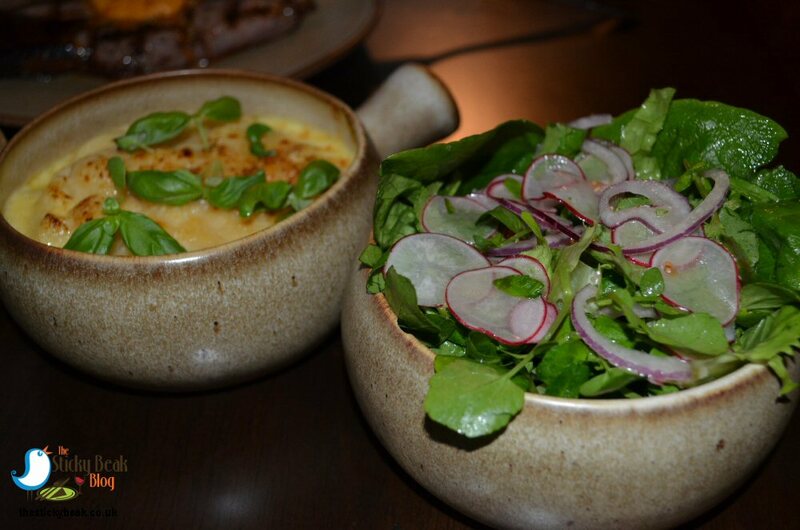 It was a super-fresh, crunchy, texturally great example that had thinly sliced Radish and Red Onion dancing alongside tender, young Watercress leaves with their peppery flavour. The quarters of sweet Cherry Tomatoes lightened the effect very cleverly and it was all topped off with a touch of light, zingy salad dressing and a dash of salt flakes. My mouth was swooning in delight, sucker-punched by the sublime flavours coming in all directions from the steak, the Lobster Mac ‘n’ Cheese and the salad! Callum hardly needed to ask the question of satisfaction, I’m sure our ecstatic faces were all the answer he was seeking. Throughout the evening we noticed how well the team were working together; they remained relaxed and unhurried, yet were always very attentive to the diners needs. 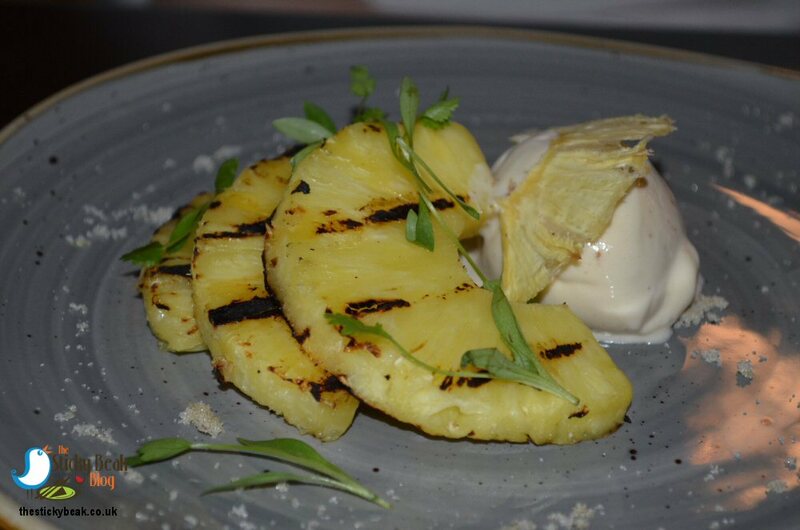 For pudding I had the Barbequed fresh Pineapple served with Rum and Raisin Ice Cream and The Boy Wonder chose the Ginger Parkin with Ginger beer poached Pear, and Pear Sorbet. The Parkin had a true Ginger taste to it, not an artificial one and also had a superb texture to it; neither too dense nor too light. The Poached pear retained a gentle firmness and wasn’t grainy on the tongue, something that you can occasionally find. A hint of the Ginger beer used to poach it was discernible on the palate. Finally a wonderfully light, fragrant Pear Sorbet needed to be savoured and appreciated for the depth of its taste; it avoided being watery and insipid, another fate that can befall inferior efforts. 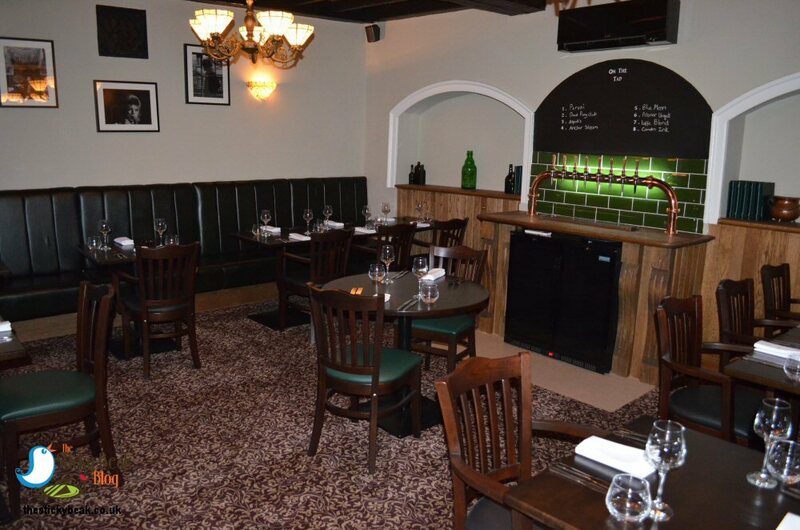 At the time of writing this article The Belfry Steakhouse is open on Thursday, Friday and Saturday evenings only, but I have heard rumour that if it continues to be so well patronised that it will also open on Wednesday evenings; let’s hope so! Not only is the menu pretty extensive, they also have a good specials board. When we went, there were a 39oz Tomahawk steak and a 46oz Longhorn Porterhouse steak (both to share) on offer, priced at £58.95 and £68.95 respectively. These both included two sauces and two sides in the price, so for a couple dining it works out at incredible value for money, especially given the quality of the meat and the service you receive. With no hint of exaggeration, I can honestly say that this is the nicest meal The Man and I have had for quite a while. To say it has only been open since 9th February 2017, The Belfry Steakhouse is quickly going to become Derbys “must go to” eaterie; it is an extraordinary restaurant serving quality food in a historic venue with a team that want to ensure you have a perfect evening. For once, I am going to eschew our catchphrase and rather than say “Hot Wings “I shall say “DING DONG” out of respect for the magnificent Bell.